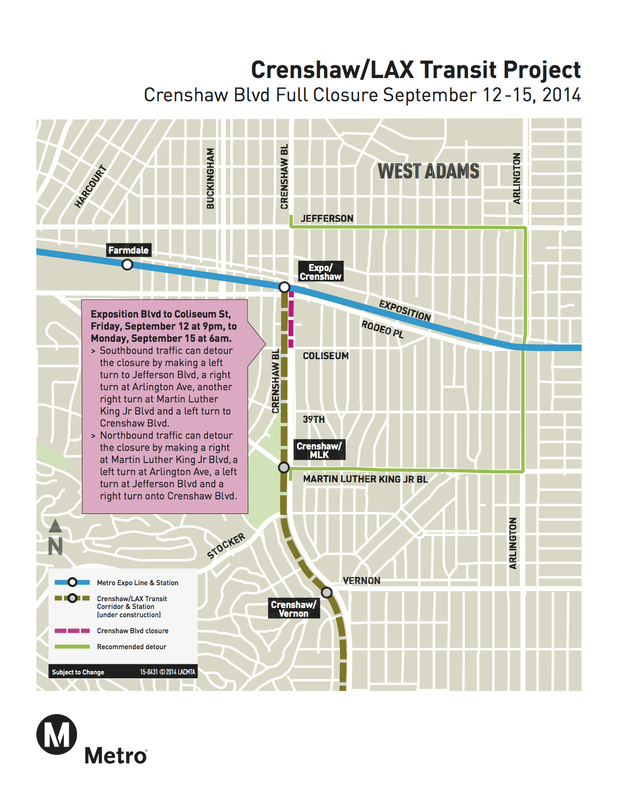 Walsh/Shea Corridor Contractors (WSCC) today postponed one of three street closures scheduled for the weekend of Sept. 12-13 on Crenshaw Boulevard for the Crenshaw/LAX Transit Project. One of the two closures that will take place this weekend is on Crenshaw Boulevard between Exposition Boulevard and Coliseum Street at 9 p.m. Friday, Sept. 12 until 6 a.m. Monday, Sept. 15. Also closures will continue the weekends of Sept. 19-22 and Oct. 24-27 with the same work-hours. Work will consist of building south and north underground walls and install steel pile beams across the street at Crenshaw Boulevard and Rodeo Place and also on Crenshaw Boulevard and Exposition Boulevard. Work on the future underground Crenshaw/MLK light rail station between Martin Luther King Jr. Boulevard and Stocker Street will be done by the Department of Water & Power to relocate water lines from 9 p.m. Friday, Sept. 12 to 9 a.m. Saturday, Sept. 13.